Amongst the trove of Sega Genesis ROMs that come out almost like clockwork every year, Sega, AM2 and Treasure have been throwing out a number of surprises lately. That bunny sure had it in for us. Consider this as your friendly reminder. 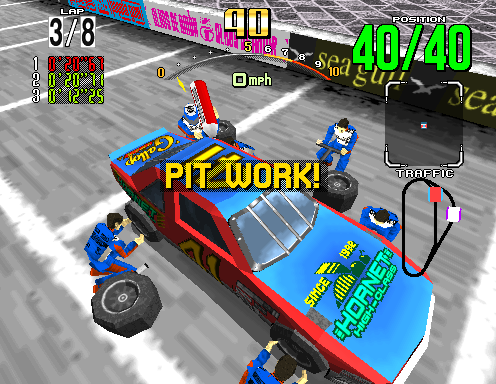 Just announced by SEGA is the re-release of Daytona USA for both Xbox Live Arcade and Playstation Network. The Sega Saturn (and arcade!) Now featuring a widescreen presentation, online multiplayer, leaderboards, native steering wheel support, and possibly the biggest feature: Karaoke Mode so you can put on your best Takenobu Mitsuyoshi. Both versions are slated for release in the US on October 25th (PSN) and 26th (XBLA) for $9.99 or 800 Microsoft Space Bucks. Be sure to check out the trailer in this post for footage of the game in action.